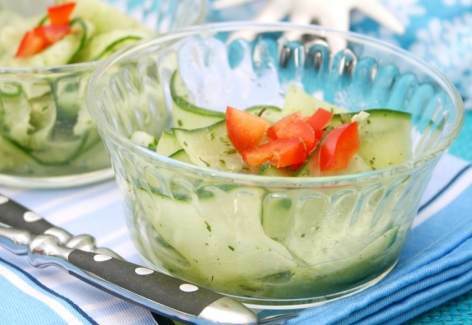 This cucumber salad recipe is a favorite salad at family gatherings. It’s so light and refreshing and is a great topping to burgers in pita pockets. If eaten that way, it does get messy so grab a few extra napkins. The combination of the cucumber and onions add that crunchy, succulent flavor to any palate, and is so easy to make. If you like to add more color and flavor, throw in a few halved cherry tomatoes.